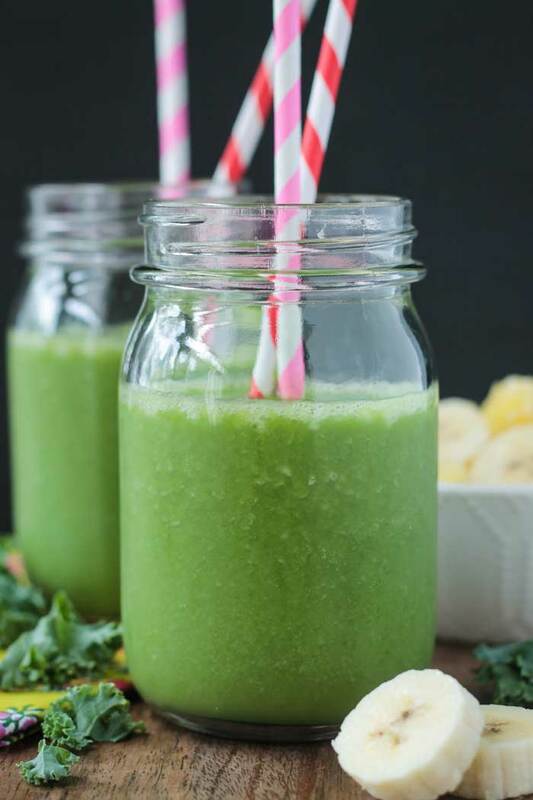 Mango Kiwi Smoothie – a creamy, dairy free smoothie with a tropical twist. Loaded with vitamins, protein and healthy fats. Start your day off right! Busy mornings call for easy breakfasts. But that doesn’t mean you have to sacrifice health and flavor. 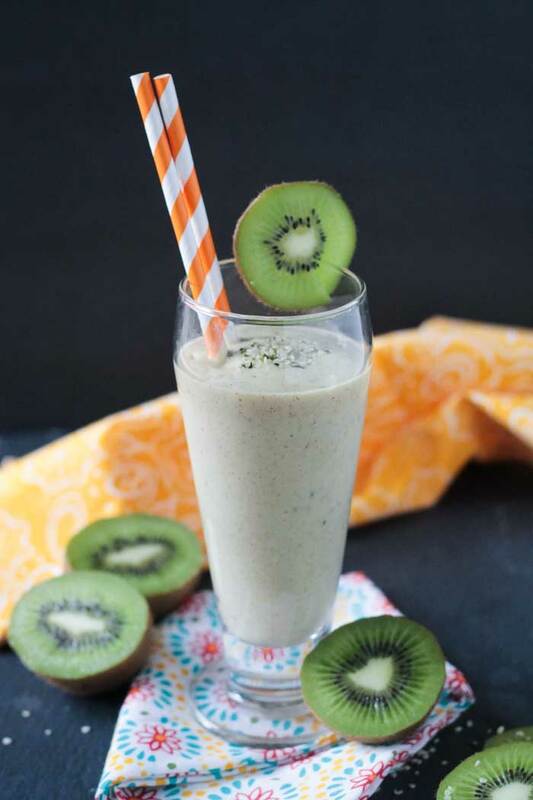 This Kiwi Mango Smoothie is full of nutritious vitamins, minerals, protein and healthy fats. It has a bright tropical flavor to wake up your tastebuds and your body. And the best part is that it can be made in less than 5 minutes! Pour it in a tumbler and go about your day. Kiwi, or sometimes called Kiwifruit, is a super healthy fruit. It has more vitamin C than the same amount of oranges. It also boasts vitamin K, fiber, vitamin E, potassium, and folate. And it only has 42 calories per piece of fruit. Mangos contain vitamin C, vitamin A, B vitamins, fiber, and potassium. 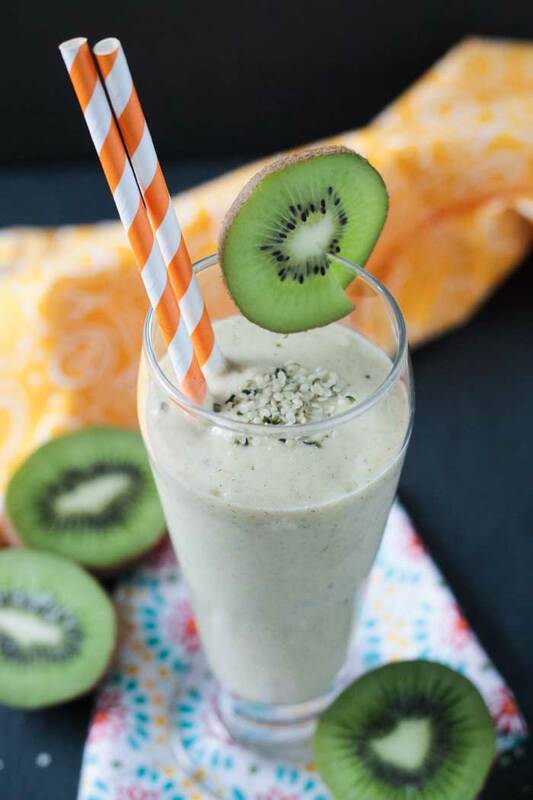 This Mango Kiwi Smoothie also features hemp hearts, which are shelled hemp seeds. They come from a plant in the Cannibus family, but it is different than the marijuana plant that is also part of the cannibus family. So, no need to worry about passing that random drug test at work or feeding them to children. They are healthy and nutritious and you should be eating them! They are super high in easily digestible protein (and are considered a complete protein!) and omega-3 essential fatty acids. You will also find iron, Vitamin E and omega-6 fatty acids. Omega-3 and omega-6 are the good fats! And hemp seeds are naturally gluten free. A few tablespoons goes a long way. Store them in the fridge in an airtight container. 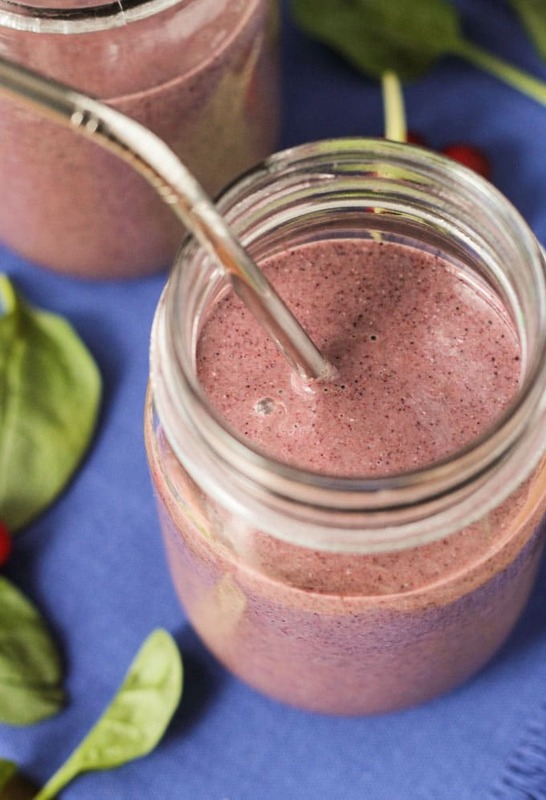 Give your immune system a boost with this creamy, antioxidant rich smoothie! Interesting fact: I’m allergic to fresh mango. There is something about the oils in the skins. I have read that if you are allergic to poison ivy, which I am, there is a good possibility you will be allergic to the oil in mango skins too. They are somehow related. If only I had read that before I found out I was allergic to mango…I probably would have been more careful. Dried mango is hit or miss, so I just skip it nowadays. The good news is that I’m okay eating frozen mango…thus this smoothie! 🙂 So, if you have a mango allergy reaction too, you may be able to consume frozen mango safely with no symptoms, but always consult your doctor if you have concerns. I hope you’ll give this Mango Kiwi Smoothie a try! Leave me a comment below with your feedback and star rating once you do. You can also find me on social media. Be sure to tag @veggie_inspired and #veggieinspired so I don’t miss it. A tropical twist on a creamy, dairy free, smoothie. Loaded with vitamin C, a good amount of protein, and healthy fats. Sweetened only with fruit. Garnish with a slice of kiwi and a sprinkle of hemp hearts, if desired. ~Feel free to throw in a handful of greens as well. Spinach, kale, or even romaine would work great. What a delicious flavor idea Jenn. I’ve honestly never thought to blend kiwi and mango together, but they must compliment one another beautifully. And I love those crunchy little hemp seeds! Any excuse to add hemp seeds – love them! Thanks, Alisa! You are allergic to mangos! The amount of information and tasty healthiness is amazing. Yes, but just the oil in the skins. It took me years to figure it out. And unfortunately my first incident of an allergic reaction was on our honeymoon!! Thanks, Revathi! Let me know if you give it a try. Two of my favourite fruits! Love this smoothie recipe. Strange about the mango allergy! I don’t have an allergy — but some kind of intolerance to kiwi and pineapple fresh. After I’ve eaten them I can’t taste anything for hours and my mouth hurts. If pineapple is cooked (or canned) it’s fine — strange how fruit can be like that! I love using hemp hearts in smoothies– such a great protein source! I’ve heard that about fresh pineapple before. My niece gets that too. I’ve never heard about it for kiwi, but they do have a similar acidic feel in the mouth. So strange how even healthy things can sometimes make our bodies go crazy. This smoothie would be delicious with strawberries in place of the kiwi if you want to give it a try. And YES to hemp hearts – so yum! Thanks, Michelle! This sounds awesome! I have never put kiwi in my smoothies before. I need to try this! This smoothie looks awesome! I am loving the tropical flavors.